Two stunning goals from Achille Emana and Samuel Eto’o in a hostile Omar Bongo stadium, Libreville rekindles hope for a world Cup qualification for Cameroon. The Indomitable Lions arrived Libreville last of their pool, needing nothing but a win, against the Panthers of Gabon, group leaders. A largely overhauled Cameroonian side featuring young players like Bassong, Nkoulou, Alo’o Efoulou, Samen a Tchoyi had an uphill task, against a confident Gabonese side, seeking its first-ever world cup qualifying ticket. Beyond the sporting stakes of the game, Cameroon vs. Gabon also had a political twist to it. 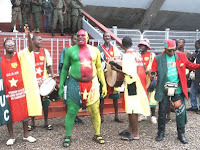 The game initially slated for June 20, was postponed following the death of veteran president, Omar Bongo Ondimba. Taking place after the contested and controversial elections of September 30, the game was clearly a high-risk one. The heir Ali Bongo Ondimba announced president Thursday, had been president only for 48hours, and hoped as is often the case on the continent, for a ‘football opium’, in a tense historic moment for his country. He was present among the 30.000 Gabonese fans. The panthers pressured for the first 45minutes, giving Paul Le Guen, Cameroon’s new coach a real scare, more than once, in his first competitive game. But second half goals from Emana and Eto’o, hushed the Gabonese fans, bringing them back to reality. The final score Gabon 0-2 Cameroon. On Wednesday, September 9, Cameroon hosts Gabon in a rematch that could well put Cameroon back in contention for the lone world cup qualifying place of the group. This belief was made even stronger by the 1-1 draw between Togo and Morocco.